Jake, who is almost twice Arr's age, takes on the role of teacher, mentor, father, and lost brother for his new alien friend. He and Arr experience adventures dealing with the Hydra, a race of lizard-like creatures who kidnap members of other species to sell on the black market as slaves; battle the Narnon on Gligula where Tuldavian Swamp Lizards lay their traps just below the surface of the slime; endure the incredible cold of the Ice Planet; dodge the Drifits of Nulian; and meet several old friends, as well as making new ones. During these travels their appreciation of each others rare abilities leads to a deep and enduring bound which will only grow stronger throughout their lifetimes. Ultimately, they must face their toughest foe, the Helavites, a species which has been preying on the weaker beings in the universe for generations. In the underground catacombs of these beetle-like creatures a mystery is solved and the grounds for the resurrection of an old world are laid. At the beginning of month, I put a request out on my Facebook author page for an Indie book to feature on this blog for September. The only stipulations were it be Science Fiction or Fantasy, be Indie and the author provide the Amazon.ca link. In the end my daughter picked one to read with me and I used random.org to pick one for West Coast Book Reviews. That's how I found Theresa Snyder and The Helavite War. I liked the old-school video game look of the cover. I remember pushing quarters into arcade games with the same feel, picturing myself in space and doing good for the galaxy. To me, each sun on the blue background promises an adventure and I'm pleased I got exactly that. 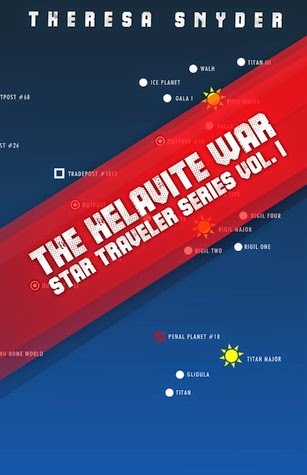 The Helavite War is the first in a series of six young adult Sci-Fi novels, the Star Traveler Series, which starts with the destruction of the Henu at the hands of the Others. Arr, a child at the time, and his brother were the only survivors. When Arr's brother dies, he's left alone. The only surviving Henu. That is, until Jake and his dar-dolf arrive looking for a little peace and quiet. I loved how the relationship between Jake and Arr grows and takes shape. Both are honest, good men who each find something they need in the other. Both make mistakes, both learn and they become inseparable friends. It's an amazing buddy story like Buzz and Woody from Toy Story and Steve and Sarah in Jeffery M. Poole's The Prophecy. They are great companions first and foremost and I really felt the strain when they weren't together. This book also has plenty of action. As a mercenary, Jake takes on jobs for pay from routing invaders to babysitting industrial operations and recovering kidnapping victims. Each little adventure they take builds on the whole and gives us hints of the Helavites, who take what they want from planets and destroy everything in their way. We get to see different planets and peoples to get a good feel for the galaxy Snyder builds. If you're looking for some great space adventure, unique characters and to find out who loves the Raspberry Goo Chews more than anyone, strap in and take The Helavite War for a ride. I missed this when it was originally posted. Thank you so much for the lovely review.